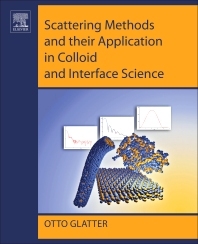 Scattering Methods and their Application in Colloid and Interface Science offers an overview of small-angle X-ray and neutron scattering techniques (SAXS & SANS), as well as static and dynamic light scattering (SLS & DLS). These scattering techniques are central to the study of soft matter, such as colloidal dispersions and surfactant self-assembly. The theoretical concepts are followed by an overview of instrumentation and a detailed description of the evaluation techniques in the first part of the book. In the second part, several typical application examples are used to show the strength and limitations of these techniques. Otto Glatter is a distinguished Professor of Physical Chemistry at the Karl-Franzens-University in Graz, Austria. He finished the undergraduate studies with a diploma thesis in Theoretical Physics at the Technological University of Graz, Austria in 1969. He received his Ph.D. from the Technological University in Graz in 1972. During the last ten years he focused on the development of new, nano-structured materials with hierarchical organization. He published more than 170 papers in international scientific journals and was invited to more than 75 international conferences as plenary lecturer, keynote speaker of invited speaker. He organized two international conferences and four international workshops. In 2012 he received the Guinier Prize 2012, Sydney, Australia; in 2013 the Overbeek Gold Medal 2013, ECIS, Limassol, Cyprus, and in 2016 the Lectureship Award of the Division of Colloid and Surface Chemistry of the Chemical Society of Japan. He is the editor of the book Small Angle X-ray Scattering (1982, Academic Press).